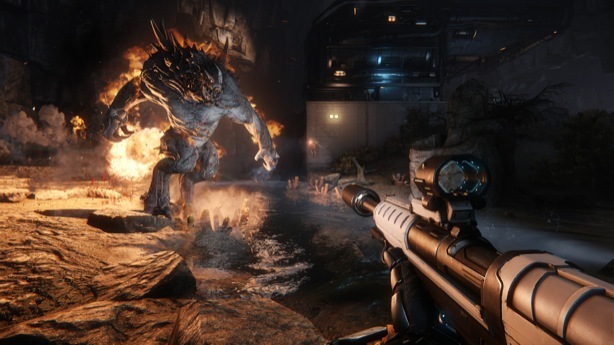 Posted on April 1, 2015 by nathanlostlighthouse	in Comics, Video Games and tagged assault, Evolve, Goliath, horror, hunters, Kraken, medic, monsters, PS4, Sci-Fi, TLL, tllgaming, trapper, video game reviews, video games, Wraith, Xbox One. So here it is, the first game in my top 5 releases this year, 4th in the list, but it could be 1st in my favourite game of this year. I have been following this game for a while before it’s release as the concept interested me quite a lot and I was looking forward to see what the finished product would look like. As soon as start you are thrown into a tutorial firstly as the monster, specifically the Goliath, a large powerful beast. 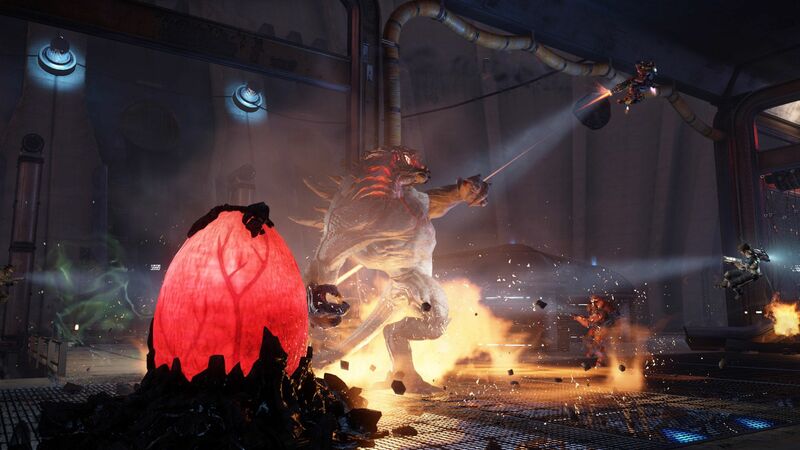 You learn the basic controls, such as running, climbing, attacking, eating and performing the Goliath’s special moves which include a jumping attack and breathing fire. I have to admit I did enjoy causing havoc as the monster, however I found controlling it very difficult as it is not very agile. Turning and escaping battle is difficult. Luckily the “Charge” move will get you out of trouble quickly, but if you have used it already, you could be in big trouble. You will also learn the reason why the game is called Evolve. As you are playing as the monster, you can eat various other smaller monsters in the game in order to regain health, increase your shield and evolve. 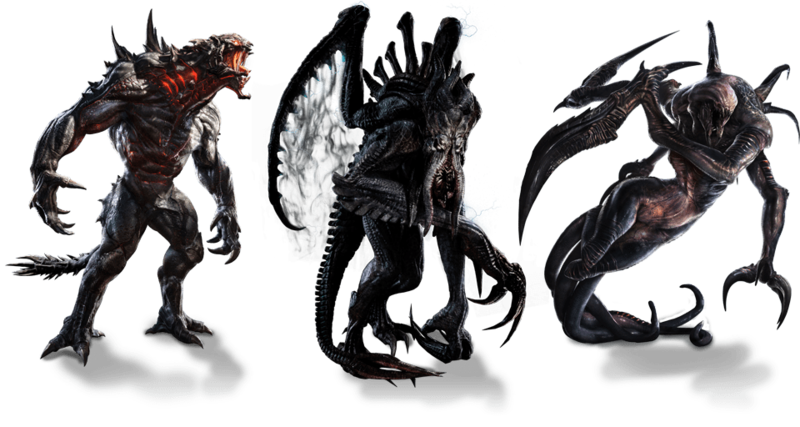 There are 3 stages to evolution, in stage 1 you are strong enough to take down small monsters with ease and also take down some of the larger monsters without too much trouble, however you would be useless against the hunters searching for you, so the idea of the game changes in stage 1. You have to be tactical in your approach, you can’t go in all guns blazing as you will get killed and very easily I might add. So you take your time and get to stage 2, you’re bigger and stronger and you can take down everything quite easily, except a group of skilled hunters, you are still going to have trouble taking them down. It also takes longer to reach stage 3, but when you do, you are nearly unstoppable. You’re at your largest, strongest and toughest, the only thing can stop you is a group of very strong, brave group of hunters. So after you complete the tutorial as the monster, you play the tutorial as the assault hunter. He is the tank and the damage dealer of the group of hunters, armed with 2 weapons, mines and a shield. The aim of the assault hunter is take down the monster, but also generate hate to keep the monster focused on him, quite a large responsibility. You start off with a lightning gun for close quarters combat and an assault rifle for long range combat. You also have mines to lay about the level and cause some damage to the monster but also locate him when it is on the run. The shield will protect you whilst the monster is laying its arsenal into you, but only for a limited amount of time so use it wisely. Unfortunately you are then left to your own devices which I thought was a real shame as you don’t get a tutorial of how to use the other monsters or hunters, you only get a small video on how to use each one when you select it. It is the same with the game modes, you are basically shown how to hunt each other. But you know what they say, learn by doing. I stuck to the single player for the time being in order to get an idea on how to play each game mode as well try out the different classes of hunter. The first thing I noticed is that there are unlockable hunters and the way to unlock them is to level up the ones you have. 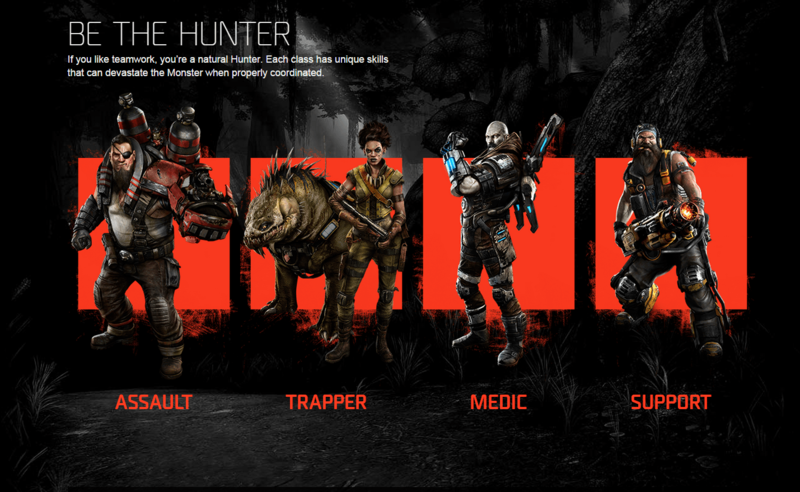 The new hunters have different equipment, such as flamethrowers and multi-firing rocket launchers. It certainly gives some incentive to play the game in order to unlock the weapons and characters. You also have to unlock the Kraken and Wraith monsters too by playing as the Goliath and levelling him up. A lot of hard work has to be put in, however the rewards are worth it. So I tried out the trapper hunter first as this was the only other hunter that I wanted to use. The trapper (surprisingly) traps the monster. The first is by using a series of harpoon traps that slow down and damage the monster, a very useful weapon. However the dome, where a large dome is created to prevent the monster from escaping, is also very beneficial. It can also be your downfall. You may think you’ve trapped the monster in the dome, but you’re trapped in the dome with the monster. I found this out the hard way when the beast was cornered but realised the AI isn’t great when your medic dies followed closely by the assault hunter. The trapper does have a good arsenal, but it is useless unless you have the whole team. So I ended the first round dismally and to add insult to injury, the monster gains a bonus in the next round. Not only did I have to go after a monster again, I also had to go after some smaller monsters as well. It is absolute carnage. It was also a new game mode that I hadn’t experienced. This mode was called Nest, where the hunters have to go and take out the monsters eggs before they hatch. So you have a large monster to kill, some smaller monsters and eventually some more smaller monsters. The odds are stacked against you, however it seems the AI improves which doesn’t make it near impossible, but you do have to put a shift in and protect that medic. Even with the odds stacked against me, I manage to persevere and win the round. Like honey badgers fighting a pack of lions, you wouldn’t think it but it does happen. Plus we get a bonus – tower defence. This put turrets everywhere in a game mode where we really needed them, Rescue. Clues in the name here, you have to go and revive wounded soldiers and bring them back to the base for evacuation. A very simple game mode, made a hell of a lot easier with the turrets. You can cheat a little bit and keep the monster in a dome whilst the rest of you evacuate the wounded soldiers. I did find this mode quite easy, however if you do have turrets as your ally it does make things easier. The last mode I played was Defend. This is difficult, you are constantly being attacked by smaller monsters and the large monster comes and goes every now and again. You can’t go after the main monster, if you leave the base exposed, the little monsters will destroy it. You just have to bide your time until you can trap the main monster. So after a couple of rounds training I decided to have a go online hoping that the players would be better than the AI in the game. Before you start your adventure online, you have to select your preferred choice of character, including the monster. I went for assault first, followed by the monster, followed by trapper, then support and lastly medic, not because the medic is boring, it’s just that I’m not that reliable as a healer. Extremely unreliable. So my first venture online was against a Wraith. This Wraith is a silent killer, that hovers above the ground and has no arms or legs but has 4 powerful scythes. It also eats smaller monster by “drinking” them. It is a truly powerful beast, may not as be as powerful as the Goliath, but harder to hunt. This made things very difficult. Luckily the trapper we had could hunt the Wraith very well, I was the assault hunter, I did my job very well, taking down the monster with the lightning gun and the assault rifle, however the medic and the support for some reason also thought they were the assault hunter and decided not to do anything else but try and kill the monster with their inferior weapons. We died very quickly. My after game rant mostly consisted of me shouting “You had one job” over and over again. The next round I got my chance to play as the Kraken, a monster that is a cross between Cthulu and a dinosaur. Again not as powerful as the Goliath, but it has a very unique arsenal, consisting of lightning strikes and vortexes to take out the hunters. Admittedly it was difficult at first trying to use the monster I haven’t used before, but learn by doing. And I got owned. Hilariously owned. It didn’t take long at all, I was trapped and I couldn’t escape. Where was this organised team when I played? Unbelievable to be honest, it was a complete walkover. The next round I ended up playing as the Goliath in a game of Nest against a team of mediocre hunters. I had to bring my A-game to the table. Luckily I managed to hatch a nest fairly quickly to get things going. Everything was overrun and by the time they had finished trying to take out the monsters, I was a stage 3 Goliath and managed to wipe out the team with ease. It was a great moment, one that I will savour. Overall the game is brilliant. The graphics are fantastic, made with the CryEngine 3, the same graphics as the Crysis series. It is dark and dank, but with an odd flurry of colour every now and again. The gameplay as the monster can be a bit laborious as it can be difficult to move the large monster, but it is something you can live with. The difficulty is fairly well balanced and it is easy to overcome a level when the odds are stacked up against you and your team. The online gameplay could do with some tweaking to make balanced teams but its not unplayable. Overall I would give this game 9 boulders to the face out of 10. Could be a potential game of the year, but there are other releases I am looking forward to. Posted on January 14, 2015 by nathanlostlighthouse	in Gaming, Video Games and tagged 2015, Arkham Knight, Batman, Doom, Evolve, Final Fantasy XV, gaming, Microsoft, No Man's Sky, PS4, Sci-Fi, The Lost Lighthouse, TLL, tllgaming, Top 5, video game reviews, video games, Xbox One. Nath tells us about the games that he is most looking forward to this year. Now with the new year under way and the next gen consoles fully cemented in the gaming market, 2015 is looking like a very exciting year for the industry. I have been looking through the releases this year, even the TBA ones that may be put back even further and compiled a list of what I believe to be the best 5 games to look forward to this year. Final Fantasy XV is only number 5 for one reason, apprehension. I love the Final Fantasy series however I feel since Final Fantasy XII, Square Enix have lost their touch with them. I’m not sure what’s been going on, but I have found the storylines, characters and gameplay to be quite weak. Final Fantasy XII just didn’t thrill me at all, Final Fantasy XIII had an annoying storyline and some terrible characters and Final Fantasy XIV sounded like a complete disaster. I played it briefly, but I had invested a lot of time in Final Fantasy XI which I thought was amazing, but they just seem to scrap all the good parts of XI to make a disaster of a game. (Editors note – Nath played XIV before A Realm Reborn, so maybe they fixed the game. But also maybe don’t release a broken game to begin with, and people won’t lose faith). So what can we expect from XV? Well a new gameplay trailer has been released and it looks like the turn-based action has gone and they have taken on a sort of Devil May Cry option. This is exciting however the whole point of Final Fantasy was turn-based action, but I will go in with an open mind. I am more excited by this game than the other previous releases, so I am hoping the game lives up to the hype. However, I am annoyed that Square Enix are sitting there and not re-making Final Fantasy VII. It is the game everyone wants and surely you can skip the storyboard as the story doesn’t need altering. Release date is still TBA, but no doubt it could be 2016, here’s hoping it’s this year. 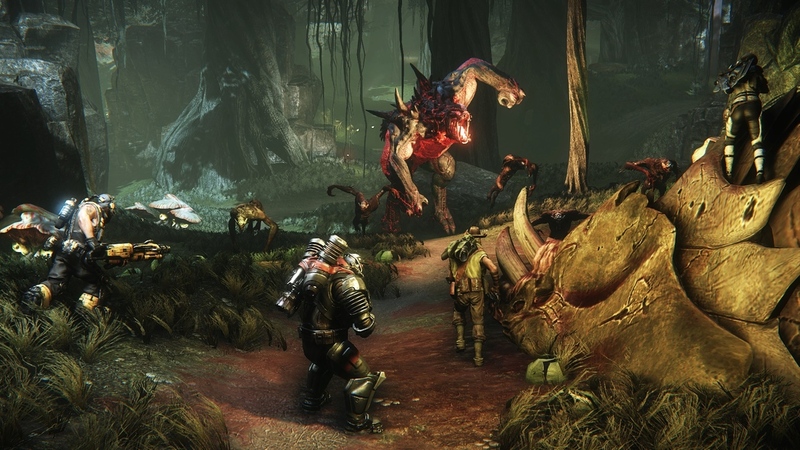 Evolve is a game I have been following a lot purely because I think the concept is brilliant. The concept is simple, there are 4 classes, Hunter, Support, Medic and Trapper. You must use your unique abilities to hunt, trap and kill a large monster in the game. Sounds pretty boring except the 5th player is the monster and there 4 to choose from Goliath, Kraken, Wraith and Behemoth, and your job is to stop the party from killing you. And that’s just the first game mode. There is also Nest, where you have to kill the monster’s eggs and the monster has to defend them, there’s Rescue where the team have to protect injured survivors, the monster has to kill them, there’s Defend where the team have to defend a power source, the monster has to destroy it and finally Evacuation which is the story mode of the game. All in all it looks likes a very good action-packed co-op game. The release date is 10th February and you can only get the Behemoth monster if you have pre-ordered the game. Have a look at the trailers and the gameplay of it to see if this game is for you. There will certainly be a review coming for this game at some point. This is a bit of a weird one, however it is one I am looking forward to. It is an open world adventure where you play a space explorer. You can interact with all the flora and fauna on every planet you encounter. There is also hostility and combat within the game too. You’re thinking this sounds like Destiny, however there is one massive catch. It is an infinite universe. Hello Games have created an algorithm that constantly generate planets. In total they have predicted that there will be 18 quintillion planets to explore. That’s 18,000,000,000,000,000,000 planets in total and it would take you 5 billions years to explore them all. The whole point of the game is to get to the centre of the galaxy in order to become an even better space explorer. It can take between 40-100 hours to reach the centre if that is your main focus, but you should explore everything as you make your way to the centre. This has a TBA release date too. It looks absolutely beautiful, definitely a game to watch out for this year, however you may not be able to play any other game if you try and complete this game. Now this is where I become a bit of a fanboy. I love Doom, I’ve loved every Doom game that has been released, every add-on. I’ve played every game level of every game, even tried nightmare mode very unsuccessfully but still I love this game. You can imagine how I felt when I heard there was a Doom 4, however it has dawned on me that Doom 4 is a reboot called Doom. I’m not sure if this means that it will be a reboot of the original or whether it is new gameplay, all I know is that iD is now owned by Bethesda so hopefully we can expect some big things. Some rumours have said that there will be sprinting, double jumping and mantling involved and just like the classic games, no regenerating health and no reloading. So we are looking at a reboot but with a few modern traits added. Apparently there was a gameplay trailer showed at Quakecon, however a video hasn’t surfaced yet. Again this has a TBA release date so I can only assume that it could be pushed back, especially as there isn’t much information about it. However it is something I am hugely excited about. Lets hope there is more news to come. Now this has easily made number 1 on my list. I love the Arkham games. The first game surprised me, I didn’t think it would be any good, however I was wrong, so very wrong. This game was brilliant in so many ways, storyline, graphics and gameplay were fantastic which is rare among games nowadays. Arkham City introduced more villains and bigger area to explore, and was another brilliant game. 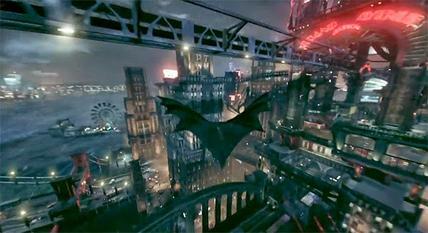 This is the third instalment of the Arkham series, Origins is from a different developer. Arkham Knight is set in Gotham City, an environment 5 times bigger than Arkham City, the main villains are the Scarecrow, Two-Face, The Penguin, Harley Quinn and the Riddler. Shame there is no Joker, but still, he can’t have all the glory. You also have the Batmobile which is awesome, this allows you to move around the city with ease. 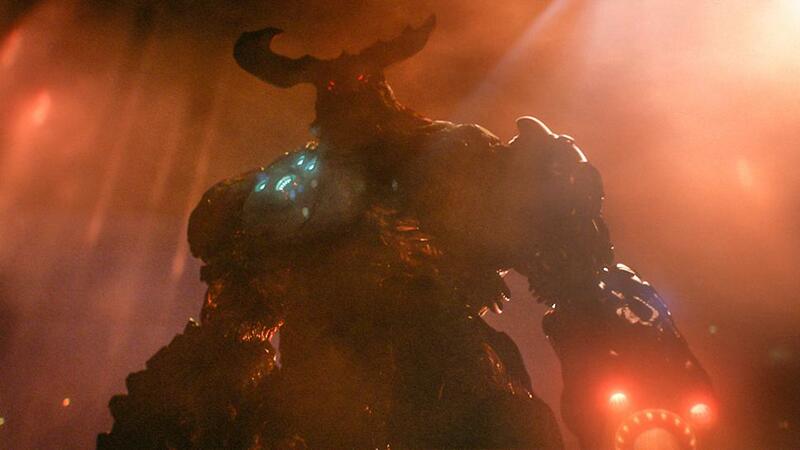 There is also a new character created to be an antagonist called the Arkham Knight. I really, truly hope this game will be as good as its predecessors. This game is scheduled for release on the 6th June this year. This game will certainly be reviewed and probably be the best game I will play this year. We shall see though, there are many other games being released this year that I am sure many other people will be excited about, however this is my top 5 and I will hopefully be able to play all of them thoroughly. I doubt I will have much of a life this year. What games are you looking forward to this year? Let us know in the comments!